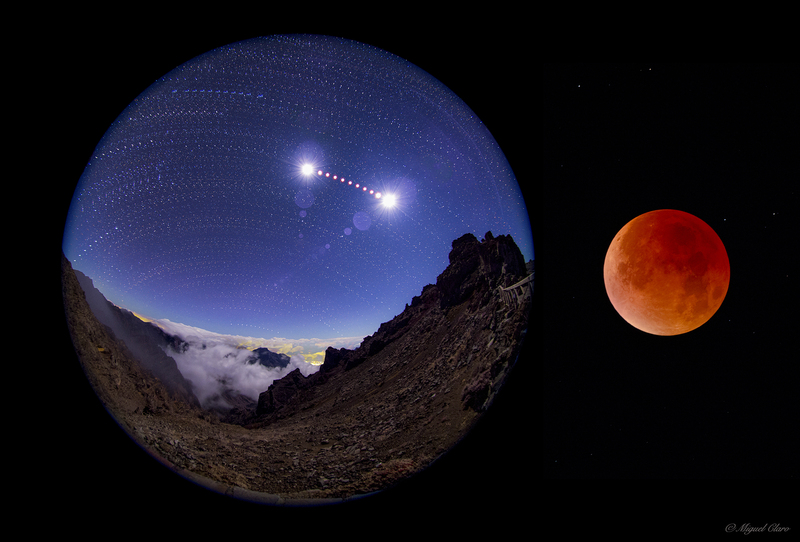 Explanation: At left, a dramatic image sequence follows late September's total lunar eclipse above a rugged landscape and sea of clouds from the Canary island of La Palma. Composited in a circular fisheye projection, the brightness of the Full Perigee Moon changes drastically in transition from outside the total eclipse phase compared to its dim glow during the 72 minute long totality. At right, a single frame captures the dark red lunar disk in a moment during the total eclipse phase, the Moon deep within Earth's shadow. In fact, the size of the eclipsed Moon image at right approximately illustrates the relative size of Earth and Moon, when compared to the circular projection of the eclipse sequence.